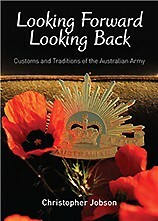 Looking Forward, Looking Back explores the Australian Army's rich and proud history. The Australian Army boasts a broad variety of traditions, some of which belong the the Service as a whole, others to a particular corps, regiment or rank. Some are solemn, some are humorous, and others incorporate the rules of social etiquette, manners and style. Many of the Army's customs and traditions are derived from the battle tactics and fighting attire of old. Some of the drill movements seen on today's parade grounds were originally practiced by soldiers in battle. Christopher Jobson was born in 1946 and educated at Cranbrook School in Sydney. A professional soldier, joining the Australian Regular Army in 1968, he served in the Royal Regiment of Australian Artillery and saw active service in South Vietnam. During his Military career he had numerous instructional and regimental postings, including the Royal Military College, Duntroon. He was promoted to the rank of Warrant Officer Class One in 1986 and his postings since then included Master Gunner at the School of Artillery, Regimental Sergeant-Major 4th Field Regiment and Regimental Sergeant-Major Headquarters 3rd Brigade. In 1996 he was posted to Army Headquarters as the Army’s Regimental Sergeant-Major Ceremonial & Protocol, and in 1998 he was posted to Australian Defence Headquarters as the Regimental Sergeant-Major Ceremonial. Christopher Jobson took discharge from the Army in 1998 to take-up the position as the Australian War Memorial’s Ceremonial Officer.